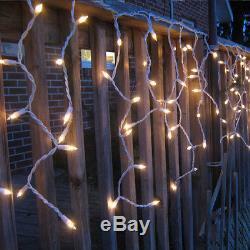 OUTDOOR LED ICICLE LIGHTS IN WARM WHITE (SELECT SIZE & COLOUR ABOVE). Length: 10 Metre - 50 Metre (select above). The best and brightest available! LED Quantity: 320 LED's per 10 Metre Length. Fully waterproof sealed for outdoor use, extra long lead to UK plug. IP68 Fully Waterproof Controller (built in memory). Heavy duty transparent cable between the lights (will last for years). Effects include static, flashing, chasing, fading, etc. Built in Memory - Remain on the last effect until instructed otherwise. We have a wide range of low energy LED lighting for households / workplaces as well as decorative LED lights which can be used for events or celebrations. These high quality LED icicle Lights are a great way of creating a professional look for any scale of project over the festive season. The Icicle Lights are manufactured with heavy duty materials and high quality branded chips, all lights and wiring are fully waterproof sealed which ensures they will never fail on you once installed The Icicle Lights include an 8 function controller which offers various effects such as static, chasing, twinkling, etc. Our controllers have a built in memory meaning they will always remain on the last setting until instructed otherwise; this is obviously beneficial if you have installed the lights in a position which is difficult to access. Our LED Icicle Lights also have a generous 8 metre power lead and are fitted with a UK plug allowing you to simply plug them in and away you go! This listing allows you to choose from 10 metre to 50 metre in length, whichever length you opt for they come complete and ready to use. No additional items such as transformer, etc are required like some alternatives. As with all our products these LED Christmas lights meet all UK safety regulations. STRICTLY LEDS UNIT 10 BIZSPACE MILL LANE COPPULL LANCASHIRE PR75BW COMPANY NUMBER: 3512768 VAT NUMBER: 704156757. Please include a note stating your order number, name, address and reason for returning so we can deal with the return immediately and avoid any delays. The item "WARM WHITE LED ICICLE LIGHTS OUTDOOR CHRISTMAS XMAS LIGHTING SNOWING DROPS UK" is in sale since Saturday, September 06, 2014. This item is in the category "Home, Furniture & DIY\Celebrations & Occasions\Christmas Decorations & Trees\Christmas Lights". The seller is "strictlyleds_co_uk" and is located in Chorley, Lancashire.